Mobile apps are the order of the day! Quite obviously when you can get the world in your fingertips with a mere swipe, you get all the more dependent on them. The major trending players available in the market are iOS and Android OS. However, fact remains that Android has changed the scenario of the mobile development and has bagged almost 70% of the market share. No wonder it is called the mass mobile OS! If you are a freelance app developer, you might find this article useful. 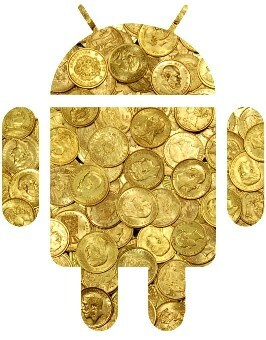 Today, we are going to tell you some avenues by which you can make some bucks from an android app. One of the easiest and preferred ways to earn the money from the Android is to fix a price for the application which you have developed. So that whenever the user downloads the application they are prompted to pay the amount for using it. You could assign an app- license ,which would need to be renewed after a certain period of time. Some of the top paid applications which are already available in the Google Playstore are- swift key keyboard, Titanium Backup Pro Key, Nova Launcher Prime, HD Widgets etc. It is only fair that you get rewarded for the efforts you have taken to develop an app! It ensures that users have purchased some of features, services or credits which are available in the game or the application. For instance in most of the trending games you can unlock some features, boosts, upgrades and enhancements to enjoy it to the full. You are sometimes offered coins or other credits during the game play. IAP is another popular way by which developers earn for their efforts. There are many advertisements which use the entire screen for the display of the ad. Alternatively, the advertisements can flash across the application or popup any time during the gameplay .The advertisement of this kind does evoke the high end eCPM then the usual or the traditional advertisements. AdChoices, AdSense and other popular ad-platforms have enabled apps draw relevant advertisements displayed during the gameplay or execution of the app. The currency is used in the games where the users have to earn money or pay money for some items or product to purchase. For earning the currency, users have to complete the number of advertisements for the offers and have to watch the videos of the advertisements via the application of virtual currency. With this application, users can buy the virtual items. There are large numbers of sites through which users can seek the ad networks. Some of those are Tap joy, Ad colony etc. The application or the game which has been developed by the Android developer can add any single advertisement or banner in their application and earn simple and straight forward money. This involves less complexity but sometimes hampers the visibility of the app for the end users. Some of networks of android which can be used by the developers are inmobi.com and admob.com. Android developers can now go through the website Startapp.com and make money with apps simply with few clicks. As many applications are being downloaded, the developer gets the opportunity to earn money accordingly. The website clearly states that developers would be earning an amount of around $55 for every 1000 downloads approximately. Even the developers can focus their attention towards the advertisements and enrich the brand value. Site startapp.com seamlessly helps the developers in making money from their monetization search options.